Here at the Squash House we're having the heat wave that most of the West Coast is experiencing. As a result, Mr. Squash and I have been getting up much earlier than usual so we can putter in the yard, pick berries and veggies and run our errands before it gets to hot to do anything! I shot this video while eating breakfast outside this morning. If you crank up your volume you can not only hear the birds chirping, but maybe even Mr. Squash crunching his cereal! It was absolutely perfect and still this morning with the sun still down low in the sky! 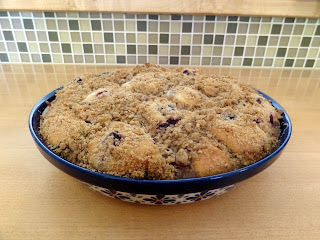 Before noon I baked a new recipe called Peachberry Buckle that I got from the King Arthur Blog. You can find it here. I hope it tastes as good as it smells! Gracie May is now having a nice nap! What a beautiful back yard. The bird sounds are so clear that my cat, who is napping in my lap, had to get up and look around for the bird. I imagine she was hoping it was somewhere close by. Unfortunately not, as we are in N.C.
Also unfortunately, I am no reply, so no need to try to respond. Gracie May has the right idea for how to deal with a heat wave! That Peachberry buckle looks awesome. I'm off to check out the recipe. Stay cool! Oh, my, the berry thing looks wonderful!! I made one very similar to that using peaches and cherries just a couple of days ago. Does Gracie have Mr. Squash under control, or what????? Stay cool. What a nice, peaceful morning! Sorry about your heat wave - I know the older I get, the less I like summer. We are lucky here in the midwest, it is nice and cool today - only mid 70's. Glad Gracie is keeping Mr Squash under control. Your backyard is just beautiful and the picture of your dessert looks like it came out of a magazine! Thanks for sharing the link...I'll check it out. Good day to Mr. Squash and the girls! I enjoyed catching up and seeing they have become good friends/sisters! Congrats! wHEW! Your garden looks just beautiful, and it seems so quiet and peaceful. Take care! I hope it cools down a little bit for you this week. lazy days of summer. I went to check out the recipe. Yum! Your cat is adorable. The berry thing looks divine. What a beautiful peaceful morning with birdsong. I'm hearing raindrops here this morning. Yesterday was sunny so I got more overdue tasks done outside.